Jo Lawrence’s AI-driven animated film DATACOSM offers a playful and unpredictable interpretation of our changing relationship to technology. Artificial intelligence and music drive Jo Lawrence’s large-scale animated film installation Datacosm. We chat with Jo to learn about the process of making the film, including her collaboration with the AI team from Cambridge Consultants. How would you describe Datacosm, as its creator? Datacosm is an animated and live-action installation film whose textures and narrative are driven by the responses of an artificial intelligence called The Aficionado. This highly accurate and cutting-edge AI, developed by Cambridge Consultants, is able to identify genres of music played live alongside the screen by a pianist. The Aficionado analyses and recognises one of four genres – baroque, classical, ragtime, and jazz – and composites corresponding layers of film from a pool of animated sequences. By layering backgrounds, events, and puppets, the music propels the AI to create microworlds with atmospheric and stylistic qualities unique to each musical genre. What story does Datacosm tell? The metaphorical world of the Datacosm is a puppet theatre. Three performers play puppeteers who mediate between the “real world” and the world of digital space. 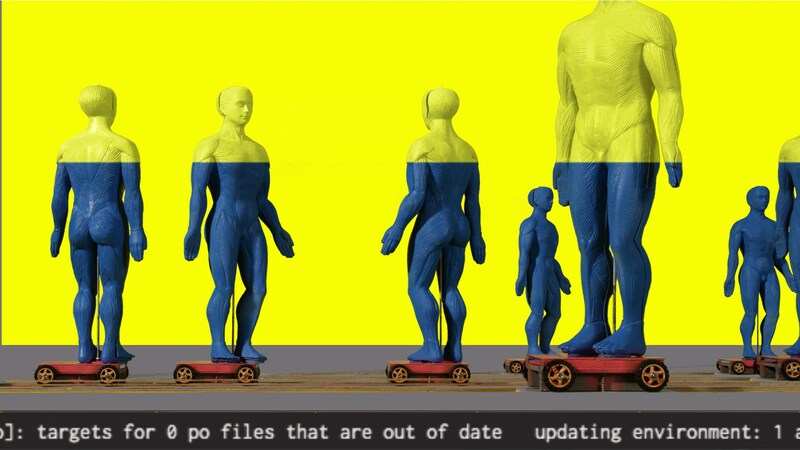 (Real-life data programmers from Cambridge Consultants – who’d also worked with me to help integrate the AI technology driving the film – also played puppeteers in the final Utopian picnic scene, but sadly they’re not included in the final cut.) These puppeteers control events in digital space from beneath the stage of the puppet theatre. Their hands are always visible as they operate the puppets, objects, and cubed analogue data, creating microdramas on the digital stage above. The film follows the process of planting of seed data, followed by the harvesting and transportation of data, and the hacking and corruption of the datafeed. Then, one individual is “rewired” by ingesting the corrupted datafeed. The subsequent spread of a thought virus leads to contamination, which alters the Datacosm forever. The AI then selects one of four endings as branching narratives: Apocalypse, Utopia, Contamination, and AI Takeover. The film’s focus shifts between three perspectives: the staged puppet world, the data programmers/puppeteers below, and a mixture of both. Between these worlds, authentic code scrolls along the equivalent of a subtitle bar. Data itself is mostly represented as a blue substance – first as blocks, then in powder form as datafeed. How did this project come about? Was there a specific point of inspiration? It all started with a chance email attachment: a Word doc full of code – pages and pages of it. This led me to contemplate the poetry of code as well as our total reliance on data scientists and programmers to create the digital world for us. That’s what triggered my original project proposal submitted to Collusion to participate in the Data Lab workshop of January 2017. At the Data Lab, I met the Cambridge Consultants team working on The Aficionado. The lab also got me thinking about data as an analogue substance, which led to many ideas for a narrative: data can communicate, it can be grown, farmed, harvested, stored, distributed, consumed, corrupted, and disseminated. Inspired, I developed ideas for a narrative animation exploring data-based themes using a combination of stop-motion animation of puppets and objects, pixilation, and film. Were there any unexpected challenges working on this piece? The biggest challenge was the realisation of the sheer scale of the project. It required three actors and a 4-by-2-metre stage, which was built in London by Simon Tayler (who also designed the set) and transported to Anglia Ruskin University in Cambridge for filming of the live-action sequences. There was a terrible moment when we thought the puppet stage couldn’t physically enter the studio at Anglia Ruskin. It cleared the door by 2 cm! Tell us about your experience working with Cambridge Consultants. I had two possible thematic approaches to the project: one light and fluffy and one much darker, involving the demise of one of the performers. I presented both ideas to Cambridge Consultants’ head of AI research, Dominic Kelly, who was keen to explore the broader impact of technology, and we selected the darker version as the focus of Datacosm. Datacosm was so much more exciting with this darker quality. I carried on developing the idea as a response to The Aficionado’s capabilities, which worked in harmony with the ideas I’d already been exploring around visualising music, pitch, and data. It was a pleasure to see Collusion’s resident technologist Rich Hall working alongside the AI experts from Cambridge Consultants to produce the programming interface linking The Aficionado and Resolume to make Datacosm possible. It was also great fun filming Cambridge Consultant data scientists and actors Marie Fortune, Chip Colquhoun, and Greg Arundell together in one of the four branching end narratives, which involved them consuming enormous wafers the size of dinner plates in the Utopian picnic scene! To experience Datacosm, visit the Collusion 2019 showcase at Cambridge Junction from 12-22 April. Keep an eye our our Events page for live performance times.